"Hai Phong is a coastal city located at the mouth of the Cấm River, in north east of Vietnam and about 120 km east of Ha Noi. It is the third largest city of Vietnam and the north's most important seaport with its deep-water anchorage. The city's name actually means "coastal defense". 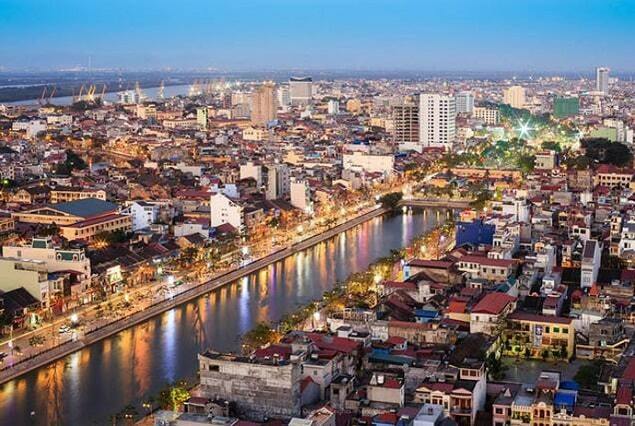 Hai Phong is not listed as one of the tourist heavens in Vietnam, nevertheless it can be a good city to explore the Vietnamese lifestyle and culture." In contrast to - the two nearby highlights such as Halong Bay and Cat Ba island, Hai Phong (Haiphong) draws fewer tourists, unless they arrive in North Vietnam with a cruise ship. Still, the city possesses beautiful architectural buildings with a clear, French colonial influences from the early 20th century. 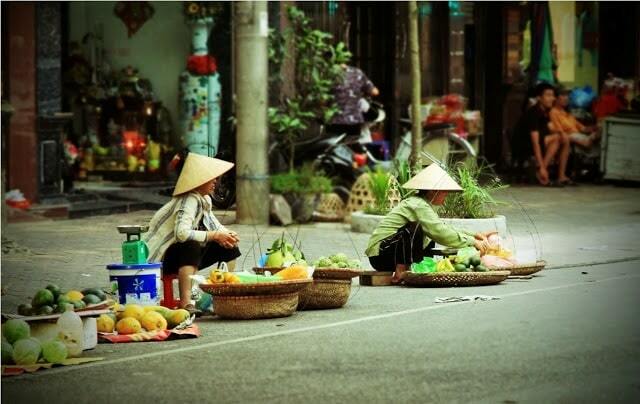 The old town is one of the most important seaports of Vietnam and it's situated about 100 kilometres from Hanoi. The main industries in the city include shipbuilding, cement, glass, porcelain and textiles. The city is located in the delta of the Red River. When French colonists arrived in Vietnam in 1858, Vietnam became the official new kind of colonial nation of France. The port city of Haiphong was vital for France. Hai Phong was the port to carry out Vietnamese products and natural resources. Many French colonial buildings have survived the last war with the Americans, such as the railway station, the Cathedral and the Opera House (Municipal Theatre). These buildings are located in the centre. The French cleared an old market in a square to make way for the Opera House, which was built from 1904 till 1912. The French architect deliberately copied the design and also used the same materials as they used for the Palais Garnier in Paris. For a city that is in the grip of business, Hai Phong has still not lost its grip on the simple charm of Vietnamese life. Visit a number of pagodas and temples, which are scattered throughout the city, or do you like more of nature? Then you can enjoy one of the many lakes such as Tam Bac Lake, where you can buy fresh flowers at indoor kiosks on the eastern side of the lake. You can also visit the Hang Kenh Tapestry on the southern side of the lake to see how wool carpets are made. Are mountains more your thing, then the nearby Kien An District is very beautiful with its many hills and mountains. On top of the highest Thien Van mountain is the Phu Lien observatory. From this vantage point, you get a clear picture of the port city of Hai Phong and environment. 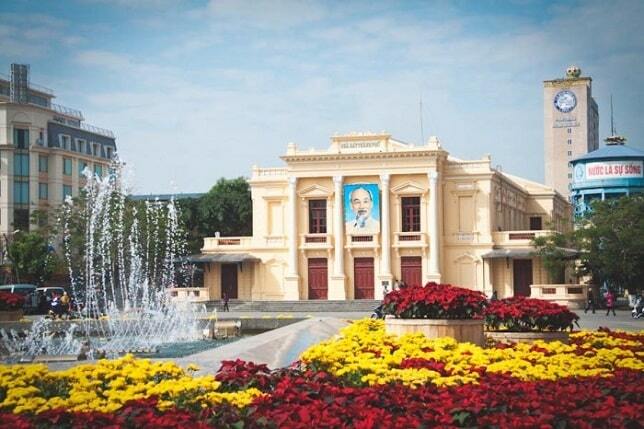 If you prefer strolling through the city, you should start your visit in the colonial district Dien Bien Phu street and Tran Hung Dao street, from where you can walk straight to the old Opera House. From here you can start the walk around Tam Bac Lake. There are five indoor shops selling fresh flowers around the lake, sold by happy, smiling girls. There are still remarkably old Vietnamese buildings in Hai Phong. Some still have French colonial influences. The Du Hang Pagoda in the centre of Buddhist Hai Phong is a very pure and graceful temple, which was built in the 17th century. The pagoda has been renovated several times. The pagoda has many gorgeous woodwork, bronzed statues and a bonsai collection. A series of Buddha and Bodhisattva images are marked a round pond with water lilies in a flowery garden. There is a quiet tower-like cemetery where monks are buried, who have lived in the pagoda. The pagoda is the oldest building in the city. If you're lucky and visit the pagoda at full or new moon, you have opportunity to make compelling photo's of religious women with black velvet scarves and a brown long dress. They're in and around the main sanctuary of the pagoda, while the monks pray or give lectures on Buddhism. Not far from the pagoda, at the end of a very narrow market street are the Hang Kenh Pavilions, dedicated to the Vietnamese hero Ngo Quyen, who lived in the 10th century. 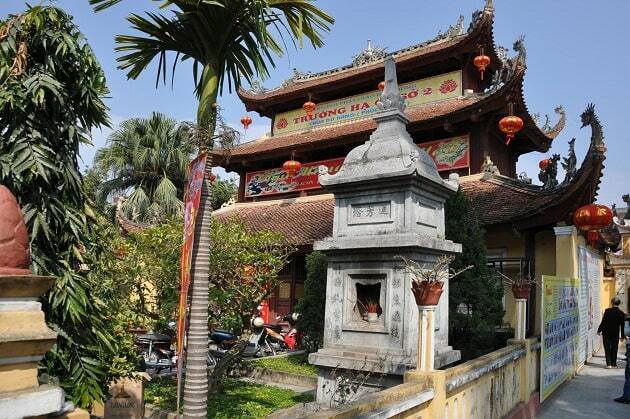 If you still want to visit a temple, go to the Nghe Temple. This temple began as a small temple, dedicated to General Le Chan, but has become an important religious site. Hai Phong is a thriving city with new housing projects. There are also modern amenities built shopping and leisure projects. A good example is the large Thuy Duong Plaza, which has a Parkson Plaza Shopping Mall in it. Almost adjacent is the Big C supermarket with a large number of small businesses. On the other hand, you can for little money visit the Cho Sat Market and Tran Phu street in the centre .. Souvenirs, where you have to look for in Hai Phong are lacquer-ware items, porcelain items, ceramics, woodcarvings and silk products. Vietnam is a great country where crafts are sold and Hai Phong is known for its high quality tapestries and rugs.